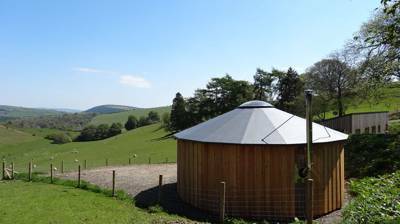 Walcot Hall Glamping is a fabulous country estate and perfect for exploring the beautiful Shropshire Hills. 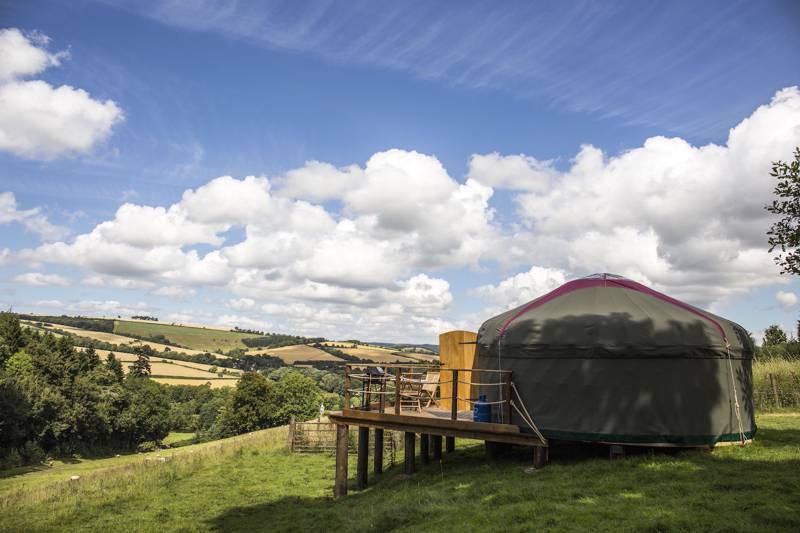 They have a wide range of glamping options - yurts, gypsy caravans, romantic shepherd huts and two 'showman' caravans and a converter fire truck. You can save 10% of all bookings before 30 April. To book, please call 01588 680570 and prices start from £120.00. The real camping dream is often a slightly exotic one; alpine mountains kissed by the morning sun; dusty orange rocks curling around Himalayan valleys; salmon jumping beyond your tent flaps in North American forests; the rich aroma of pine needles tingling in your nostrils. The same smells, sounds and romantic camping atmospheres are closer than you think though. Come to the feet of the Shropshire hills and you can find the exoticism of foreign fir tress, bygone birches and Pacific pines at your fingertips, and still with that all-important English country pub just a hundred yards away. Now if that’s not the dream, we don’t know what is! Home to one of Britain’s finest and most eclectic arboretums, Walcot Hall is the very site in question. It was back in the early 1800s that the first trees were purposefully planted here, in the sweeping grounds of a grand stately home, and since then both the trees and the collection have continued to grow. Different species and varieties are always being added and today the vast range makes for an impressive visit at any time of the year. The old ones, though, are still the best – in particular a towering Douglas Fir planted by Lord Powis in 1842 and once the tallest tree of it’s kind in the entire country. 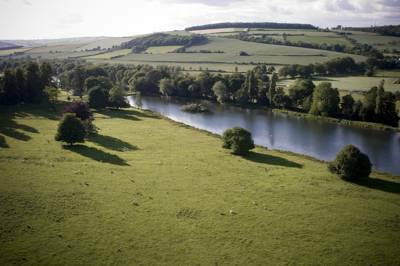 The campsite itself is tucked in a more open, grassy space directly to the rear of the Powis Arms, an ivy clad inn at the gateway to the estate. There are 30 pitches in total, half with electrical hook-ups, and excellent ablutions available in a heated amenities block. The site is ideal for those who want to spread themselves around, with ample room for large tents and fold out tables where you can sit and admire the view. The real joys here, though, are for those who really want to delve amongst the bows, camping beneath the arboretum canopy in one of Walcot Halls hidden treasures. 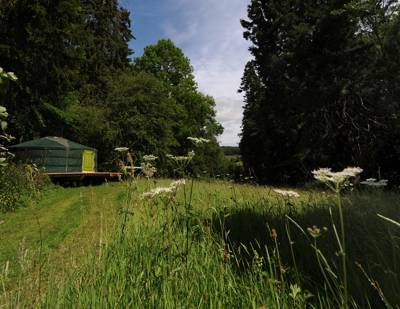 The campsite now boasts no fewer than ten different glamping hideouts spread around the 30-acre site and the majority are tucked up amongst the trees providing a true sense of woodland seclusion. Sticking with the spirit of diversity these too are a varied bunch, from a traditional wooden shepherd’s hut and creamy canvassed yurt to an old-school gypsy wagon and a vintage fire-truck surrounded by rhododendrons. All are exquisitely fitted out in a rustic but luxury style with huge beds and nearby ablutions facilities. Whether you chose the indulgence of glamping or the space of the campsite, guests are still welcome to all the privileges of a night at Walcot Hall. There are water pools for fishermen, two large lakes with rowing boats to dabble around in and stables for those inclined – head out for a hack with Stuart Murray who’ll show you the local bridleways. For more independent travelers there’s a wealth of other activities on the doorstep (no, beyond the pub!) not least the fabulous walking opportunities in the Shropshire Hills. Try the scenic three-mile route to Bishops Castle, a thoroughly welcoming little market town accessed along a beautiful tree-lined pathway – not that you haven’t seen them before! 30 pitches, including 12 with electrical hookups. 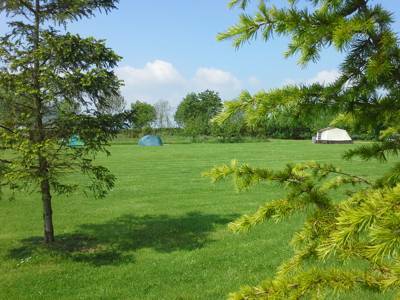 Other accommodation available including vintage caravans, yurts and a shepherd's hut. Facilities include heated amenity block with showers, toilets, washing machines, dryers and chemical disposal point. 12 of the pitches have electrical hook-up available. Walcot Hall estate has 2 large lakes with rowing boats which can be used, and one of the largest arboretums in the UK which guests are welcome to explore. Walcot Hall is an ideal place to join the trails of the Shropshire Hills (01588 674080). Many local footpaths skirt directly around the edge of the estate so it's easy to head directly into the countryside from camp. The Stiperstones (though a short drive away) are particularly beautiful, thick with heather, flourishing purple through spring and early summer, or walk famous Offa's Dyke (01547 528753) just a few miles from the site. 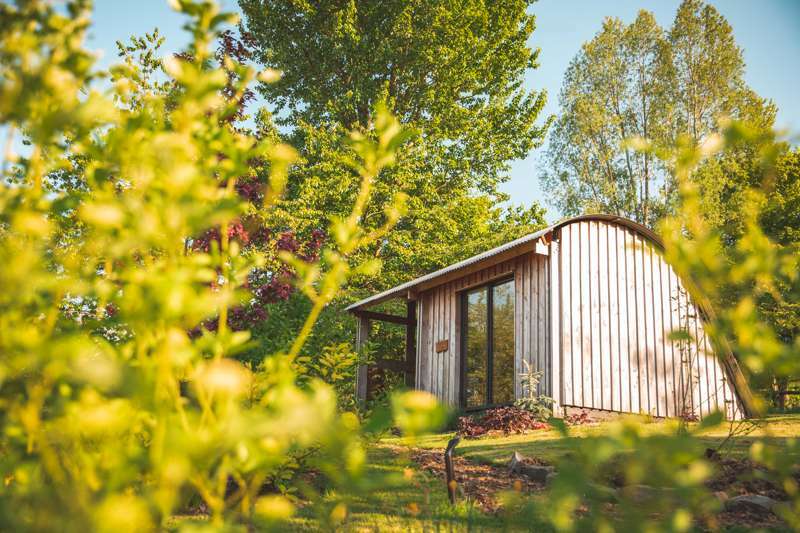 The campsite is situated 3 miles from the small market town of Bishops Castle, renowned for its alternative, arty culture and friendly community, and is 30 minutes away from Ludlow and Shrewsbury. The campsite is directly to the rear of the Powis Arms (01588 680254), a delightful pub at the bottom of the Walcot Hall driveway. The pub serves bar meals at lunch and in the evening. There is also the village shop just a short walk away. Nearby Bishops Castle (with food shops and a petrol station) is know for its brilliant beers and homemade food. Pubs such as the Three Tuns (01588 638797), the Six Bells (01588 630144) and the Castle Hotel (01588 638403) are famous for their own home brews. £5.00 per person per night and £10.00 per night for an electrical hookup. Children aged 5–16 are half price at £2.50 and children under 5 are free. See website for glamping details. The nearest train station is Craven Arms (0845 748 4950) which is approximately 15 minute drive away.